Dislocation of the major joints of the lower extremities-hip, knee, and ankle-can occur due to motor-vehicle crashes, falls, and sports injuries. Hip dislocations are the most common, and they require emergent management to prevent avascular necrosis of the femoral head. 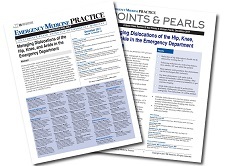 Knee dislocations are uncommon but potentially dangerous injuries that can result in amputation due to the potential for missed secondary injury, especially if they are reduced spontaneously. Isolated ankle dislocations are relatively rare, as most ankle dislocations involve an associated fracture. 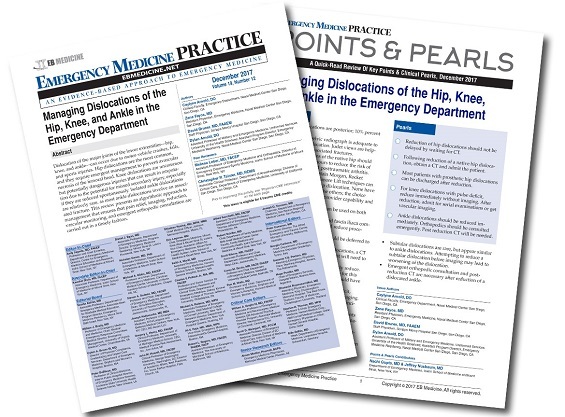 This review presents an algorithmic approach to management that ensures that pain relief, imaging, reduction, vascular monitoring, and emergent orthopedic consultation are carried out in a timely fashion. A 25-year-old man is brought in by ambulance after being involved in a high-speed motor vehicle crash as an unrestrained driver. He is complaining of right hip pain and lower abdominal pain. During his primary trauma survey, you note that his right leg is shortened and internally rotated. You suspect a native hip dislocation and/or fracture and wonder which diagnostic studies you should obtain and whether you should attempt a reduction before consulting orthopedic surgery. Later that evening, an elderly woman arrives with right hip pain, unable to ambulate. She states, “I was just bending over to put on my shoes when I felt a ‘pop,’ and then I fell to the ground.” She then informs you that she recently underwent right total hip arthroplasty. You notice her right leg appears internally rotated, adducted, and shortened. You suspect a dislocation of her prosthesis and wonder whether you should involve orthopedics or reduce it yourself and, if reduction is successful, whether she can be discharged home. I will have more awareness of potential vascular complications with knee injuries.